Check out some info on New Orleans newest Blerd-centric convention! Fun times were had at the Black Nerds Expo 2019. If you're in the San Diego area, and want to meet us at a fun filled event, read further. 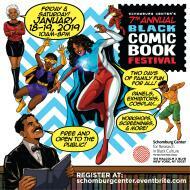 Check out news on the upcoming Schomburg Center's Annual Black Comic Book Festival! Check out an upcoming book release party for an Afrofuturisic short story collection!